Machine builders and equipment users face high expectations, limited resources and tight deadlines. For you, improvement means suppliers with the products, knowledge and rock solid support to solve production problems day in and day out. 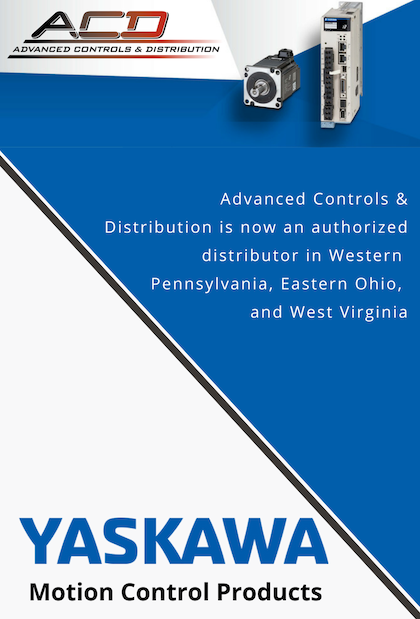 Advanced Controls & Distribution is an authorized distributor in Western Pennsylvania, Eastern Ohio, and West Virginia. Yaskawa maintains a $14M inventory of motion products in the US, for 95%+ on-time response to customer requests. Defining initial quality is simple: you get what you want. Yaskawa products ship on time, work right out of the box, perform as expected, and continue to do so for the life of your machine. Focus your engineers on their core competencies, thanks to a team of Yaskawa engineers who can instantly add value to automation design, development and support. Today’s customers need a finger on the pulse of their machines at all times. Success demands peak productivity, total reliability and endless freedom to interact. The ability to program and control robots, servos, and drives with one software package is available with the Yaskawa Singular Control concept. 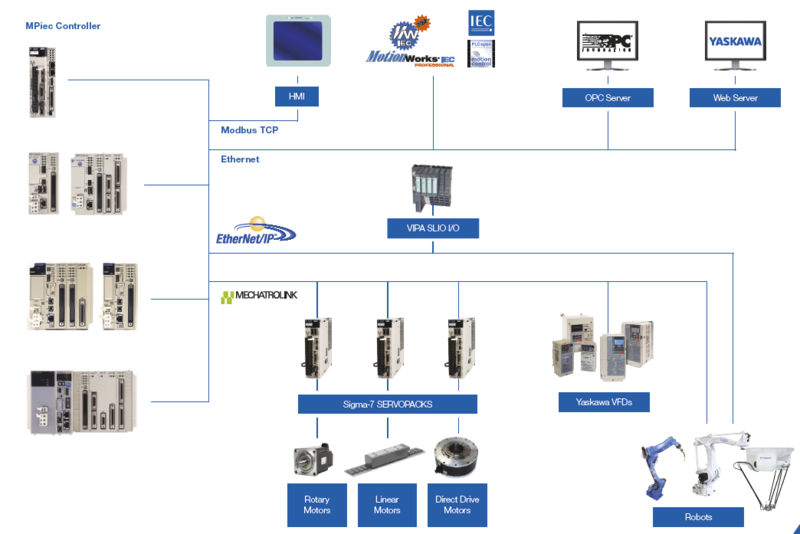 Yaskawa’s MotionWorks IEC development platform uses IEC 61131-3 programming languages and motion function blocks that conform to PLCopen standards. One Yaskawa controller covers it all for a picking operation: vision systems, multi-part conveyors, servo systems, drives, plus all types of robotic mechanisms. Replace custom robot code with standard IEC61131-3 programming. Make high-speed case packing easier by combining gantry robots, articulated robots and servo-driven automation into a single system. Then switch from one motion device to another without reprogramming! Two palletizing robots use Singular Control and PalletSolver® software to create pallet patterns and quickly change them on the fly. Use 3D vision and functional safety technology too. A snack food company needed help improving the speed and efficiency of putting more chips into a bag. This company wanted to improve the existing design for its high-speed bottle label applicator to offer greater reliability and increased through-put. A company designed a machine to separate metal parts and insert them into a housing coming from an unwind reel in strip form. From 2011 to 2013, Yaskawa shipped nearly 150,000 motors in North America with only 10 warranty failures. Yaskawa has a long track record for reliable quality, responsive support and rapid product availability. Discuss solutions and services with an expert. Advanced Controls & Distribution (ACD) is a leading full-line distributor of industrial electrical supplies, serving customers throughout western Pennsylvania, West Virginia and Eastern Ohio. We pride ourselves not only on our knowledgeable sales team and application engineers, but also on our unparalleled support of every product we sell. At ACD, our focus is simple...the success of our customers. Advanced Controls & Distribution proudly serves Western Pennsylvania, Eastern Ohio, and West Virginia.